invoking business logic defined in custom tags are all examples of dynamic content. Figure below shows what phases a JSP passed through before displaying result. when the changes have been made to JSP. Any later call to JSP does not undergo of compilation phase. · We already know java and HTML. So nothing new to be learned to work with JSP. the time to execute a JSP document is not dominated by starting a process. 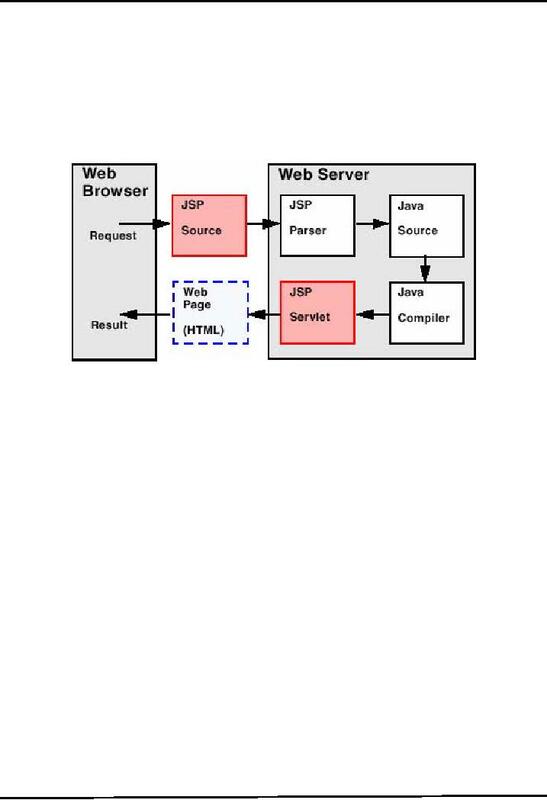 execute a JSP file is supported on many architectures and operating systems. Let's compare JSP and Servlet technology by taking an example that simply plays current date. of two strangely written lines of codes. Also there are no signs of doGet(), doPost(). "</h3>" + "</body>" + "</html>"
// Handles the HTTP POST method. Clearly, a lot of code is needed to be written in the case of servlet example to perform a basic job. Besides HTML, a JSP may contain the following elements. remaining ones will be discussed in next handouts. inserted verbatim into corresponding servlet. The above scriptlet reads the name attribute and prints it after appending "welcome"
inserted verbatim into servlet's class definition. This page only displays the two text fields to enter numbers along with a button. example is given below in XML style.